You can join and be out anytime you want. Don’t need to join from the start. Feel free to join any timing you want!! We have Basic, Beginner, Advance and All level class. But you don’t need to concern so mach about your skill level to join any class. You can join Advance class even though you’re beginner, and can join Basic class even though you’re expert. Feel free to join any time you want! Basic class + little advanced techniques. Techniques for all levels. You can learn from basic to modern techniques. ※Rental Jiu-jitsu gi is available!! You don’t need to wear gi. Wrestling with submission it looks like. If you’re MMA fighter, you can gain your grand techniques level. Or you want to gain your power, speed and stamina for Jiu-jitsu, Grappling class works very well. Just bring a T-shirt and a half pant then let’s roll!! No dangerous techniques, no punches and no kicks. Japan schools must have a Judo class, so this class works very well. Your kids can learn how to do submission safely and escape from side position, mount position and so on. 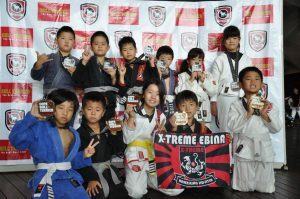 We train your kid’s heart(Cooperativeness, humanity, mentality) through Jiu-jitsu class. Both of you and your kids can enjoy Kinder(from 4 years old) class together.We’re preparing a program for your kids and his parent!. From 6 years old and above is Kids class. Students in Kids class can join adult classes as well. Please enjoy Jiu-jitsu with your parent! !